At Winterfest Mike Rizzo stated that the Nats were under the competitive balance tax for 2017, which contradicts reports from AP and the Washington Post. So far I've seen no follow-up reports over the past three weeks over an issue that could greatly affect the Nats plans for this offseason. The Talk Nats blog has reported a rumor that the Nats have appealed the MLB determination of the valuation of the Nats payroll based on how the annual average value (AAV) was calculated for the Strasburg and Sherzer contracts. I'm not sure of the possible point of dispute for the Scherzer AAV, because his contract is fully guaranteed with no team or player options, but the Strasburg contract has a huge increase in the final year, which follows two player option years. Why should the Nats have future salary counted against them for 2017 when those years are far from guaranteed? So if the Nats planned on being under for 2017 and end up over, how does that impact their plans for 2018 and beyond? If the AAV determination remains in dispute, how does this unknown factor affect the team's ability to determine their 2018 payroll? The tax definitely appears to have become a cap for a large number of teams this year, which is easy to see why based on significant cash and draft pick penalties. This is likely the reason for a slower than normal developing market for free agents. I suspect that the result will be an increasing disparity in pay, that star players will continue to see the same large contracts they've received in the past, but the mid-range guys will receive smaller offers as teams bargain hunt for free agents in back up roles along with accelerating the promotions of younger guys. Another factor that could affect the pay for free agents looking at bench roles or a shot at the back of the rotation is the extra four days off this year. The #5 starters in MLB averaged between 15-20 starts last season, shift three or four of those starts up to the aces and the top guys are worth more and the marginal guys are worth less. Same is true for the bench players, they still have value, just a little bit less when there are more rest days built in for the regulars. Since they are already over, I don't think that it will matter that much to ownership. They probably see this year as "the year" to go over the threshold and pay a penalty because Harper, Murphy, Gio, Wieters, and Madson come off the books at season's end. 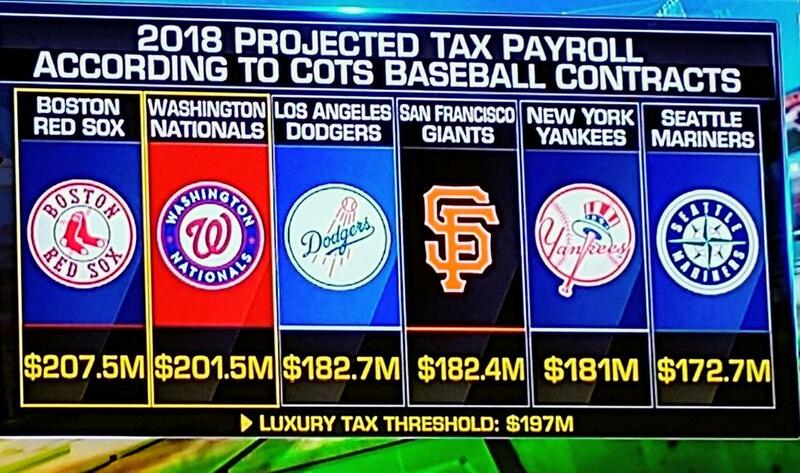 I think they play the game to see if they can "adjust" the system to benefit them, but I don't think that the Luxury Tax threshold will play as big of a deal as it would for the other big market teams. According to Rizzo they are not already over, but I agree that this is the year for the Nats to make a run, we've got a very good returning team and a lot of big market clubs are dropping payroll to prepare for the FA group next off-season. The fact that Rizzo contradicted the AP reports is a major story that the Nats media has completely missed. The Nats media probably wants to overlook that he denied the luxury tax thing. I mean, the Nats probably won't win an appeal at how to calculate AAV on certain salaries, and it is public knowledge what most of the players are making by AAV. Rizzo isn't wrong that they haven't gone over yet because arbitration salaries have not been awarded. Still, an estimate of arbitration salaries plus NOT signing Kintzler and Adams would have had around 7 Million of wiggle room below the Luxury tax threshold. Unless the Nats expect to have most of the arb guys just take HUGE pay cuts (which won't work in the arbitration process), that puts the Nats over. It might be Rizzo just playing his cards close to his vest because they are being cautious with the FA and trade markets. The Nats also know that they have an anchor in Wieters for the coming season, and it won't be easy to offload Wieters AND get back a quality catcher that would help the team for a few years. Strasburg is being counted as a $25M/year cap hit, but his 2023 salary is $45M, what happens if he opts out after 2019 or 2020? There is about $4 million per year being counted against the Nats that is over what is guaranteed if he opts out. Not enough to make up the difference between the cap and the $7M the Nats were reported to have gone over. I keep going back to Rizzo's statement that the team didn't go over, obviously he knows something that isn't public and I would not count the team out in a dispute. An interesting comment I read on Talk Nats the other day was that the claims of the MASN dispute holding down the Nats spending go out the window when the Nats are trying to stay under the cap. No one has to be left out in the cold. Just play for the best offer. I would be surprised if the league doesn't get younger this year as some veterans retire rather than take big pay cuts. Guys like Werth are going to be looking at league minimum offers. The Nats are now the second highest payroll team based on AAV. Those deferred contracts are great for saving money when factoring inflation but terrible for staying under the tax cap. Maybe implement a salary floor? We will never win it. Same as my WVU teams. My teams will be constant losers for the balance of my life. It is what it is. Obviously I agree with his point that mid level free agents are going to get hit hard with low ball offers at best, but I'm not sure why he thinks that the rich teams will benefit more. Sure it's always better to be rich, but the CBT definitely does seem to be leveling the field as a high number of team payrolls are bunched up right under the cap. Fangraphs says it's the lack of competitive balance that is causing the slow off season, that top teams don't need to improve and second tier teams are too far behind to justify spending big money. They are of course wrong. Without the CBT, there would be enough teams trying to make 10-15 game improvements to sign the middle tier players and the Yankees and Dodgers definitely would not be cutting payroll. I think it's more than the CBT though. There's a correction coming in sports business revenue across the board with the changing cable tv landscape. I always thought baseball would be the first to adapt because their CBA offers more budget flexibility than other leagues. I expect average salaries will inch down over the next few years, and agents are going to have to adjust their asks. The leveling off of team payrolls just under the cap is a strong indicator that the primary force in budgeting is the CBT. I predict that the average payroll for teams under the cap last year will continue to rise, and of course teams that were over the cap are all cutting back. I checked the CBA and found the answer to my question about the Strasburg contract, the full AAV counts against the Nats because he has player options, so the full contract is guaranteed. If there were team options the option years would not be part of the AAV. I believe that if Strasburg opts out the Nats get extra cap space in the following year to make up for the excess counted against prior years. Who are the teams that have leveled off just under the cap? I've never really seen a good source of info for where every team is, especially in the off season. Here is a screen shot of current projected salaries, with the Dodgers and Yanks most notably under the cap. Lots of other teams have room to add payroll and still stay under but lots of free agents left unsigned as well. I'd bet that a third of the league ends up within $20 million of the cap. Pretty smart ploy on their part, go just over the cap this year so the tax rate bumps to 50%, allowing them to sit out the big FA feeding frenzy next offseason. Can someone explain why this would effect the Nats? Does it just result in money spent in penalty? Or can they not spend certain amount next year? Just penalty, but the penalties grow the more you're over the threshold. It's not just money, although the cash penalties can be significant. There will be draft picks lost if the Nats sign a player who received a qualifying offer, the Nats won't get draft pick compensation if Harper signs elsewhere, and we lose a million from our international signing pool. All those hit the team even though we only went $8 million over. Potentially a major mistake by the GM.